This is yet another Free App for a person in distress and in need of immediate help. Publishers Notion Ink have launched this new App called I'm Shakti for Android smart phones and tablets. The aim of the App is to provide you with timely assistance in case of emergencies. After installation, you will have to set emergency contacts numbers within the App. If you are in any problem, pressing the power button five times within 2 seconds will initiate the distress call process. The App will then send your location along with the text message to the contact numbers you have saved during the installation. 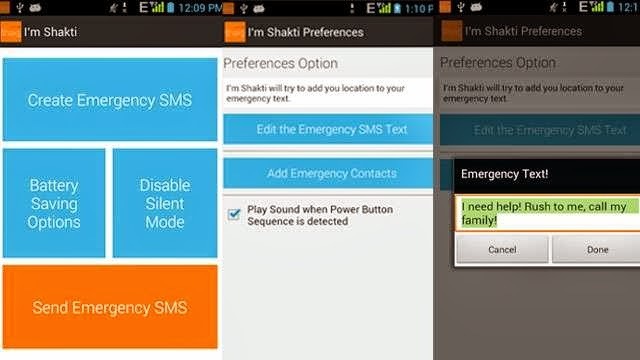 Alternatively, you can open up the application and click on the button that says "Quick Send Emergency SMS" to send the emergency signal to your near and dear ones. The App depends on GPS, cellular homing and Wi-Fi to pinpoin your location. In case due to some reason the App isnt able to home in on your location, it will send the emergency SOS message first and then start searching for approximate location. Once it targets on a approximate location, it will send a second message to your emergency contacts. The App comes with a default message for forwarding to the emergency contact but you can customise the message as per your preference. The App also has a feature which will allow you to kill all running Apps, dim the light and turn off all the connectivity in case of extreme emergency. This is a smallish App with just 501KB.